Brill - Sense, 9789462098466, 130pp. This book is a memoir in poetry about family stories, mother-daughter relationships, women's work, mothering, writing, family secrets, and patterns of communication in close relationships. 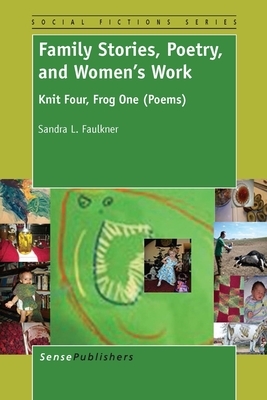 Faulkner knits connections between a DIY (do-it-yourself) value, economics, and family culture through the use of poems and images, which present four generations of women in her family and trouble "women's work" of mothering, cooking and crafting. Family stories anchor family culture and provide insight into relational and family life. This work may be used as a teaching tool to get us to think about the stories that we tell and don't tell in families and the importance of how family is created, maintained, and altered in our stories. The poetry voices the themes of economic and collective family self-reliance and speaks to cultural discourses of feminist resistance and resilience, relational and personal identities. This book can be read for pleasure as a collection of poetry or used as a springboard for reflection and discussion in courses such as family communication, sociology of gender and the family, psychology of women, relational communication, and women's studies. Sandra L. Faulkner is Associate Professor of Communication and Director of Women's, Gender and Sexuality Studies at BGSU. Her teaching and research interests include qualitative methodology, poetic inquiry, and sexuality in close relationships. Left Coast Press published her books Poetry as Method: Reporting Research through Verse and Inside Relationships: A Creative Casebook on Relational Communication. Her poetry appears in places such as Qualitative Inquiry, Women & Language, Storm Cellar, Literary Mama, and Sugar House Review, and her chapbook, Hello Kitty Goes to College, was published by dancing girl press. She lives in NW Ohio with her partner, their warrior girl, and a rescue mutt.